I could probably write a novel about how amazing my BBG Role Model is. 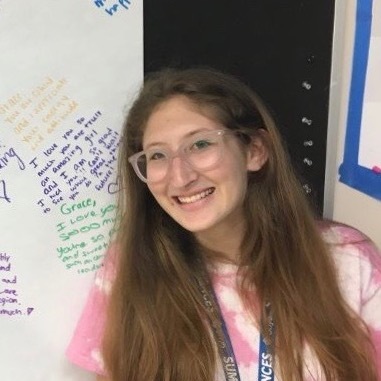 Not only is Lucy Calderon KIO’s 64th Regional Sh’licha, but she is a writer for a Louisville based Magazine, social activist, and a damn proud BBG. Thinking back to when I was a MIT, I realize how much she meant to me. She is a constant a source of positive energy, extremely loyal, and genuinely loves interacting with the people around her. These few traits really impacted me on my journey throughout BBG, and I began to wonder who other BBGs looked up to. How did the upperclassmen members when you were a MIT, make you feel included in BBG? Why is it so important for young girls to look up to someone in a Jewish setting? From an upperclassman perspective, do older girls actually seek friendships with MITs? What is your fondest memory of your BBG Role Model? If you could say anything to the International Order of the B’nai B’rith Girls about being there for younger members, what would you say? If you ask any BBG, she has a person who helped or inspired her to become who she is today. The person who took her to meetings, introduced her to her friends, or encouraged her to try something new. Every BBG is a role model in their own way, and that’s because of the standards we as BBGs hold ourselves to. So, let's all think of how we were when we first joined, how scared or uncomfortable we were. Think of how we are now, excited and motivated for the future, and most importantly, feeling comfortable and safe in who we are. Grace Malinger is a BBG from Kentucky Indiano Ohio Region and is an animal lover with an affinity for chihuahuas!